The national average price of diesel is still 9.8 cents more than it was a year ago, when the price was $2.972, DOE said after its March 18 survey of fueling stations. The decrease was the first drop in price after four weeks of consecutive increases in the average weekly diesel price, totaling 11.3 cents. But average prices for diesel, trucking’s main fuel, did not decline in every region. Prices rose the most in New England, up 1.7 cents to $3.200 per gallon. Diesel prices dropped the most in the Midwest region, falling 1.9 cents to $2.992 per gallon. The price of gasoline went up 7.7 cents, to $2.548 per gallon. Still, gasoline is 5 cents cheaper than it was a year ago. Oil closed above $60 a barrel on the New York Mercantile Exchange on March 20, after flirting with the mark for days. The close came after reports of the biggest withdrawal of crude in U.S. storage tanks since July, signaling tightening supplies, according to Bloomberg News. Thus, the diesel price respite may be short-lived. The factors pushing costs higher are OPEC production cuts, supply disruptions in Iran and Venezuela, and ongoing fears over the course of U.S.-China trade negotiations, Bloomberg said. Shrinking crude oil inventories are surprising, but not too much given the vitality of U.S. oil exports, said Denton Cinquegrana, chief oil analyst at the Oil Price Information Service. At the same time that the U.S. is exporting some oil and gasoline, imports are slowing because of OPEC cuts and Venezuelan problems. “Crude should be building (in inventories) but we have strong exports,” Cinquegrana told Transport Topics. Spring, which started March 20, usually sees gasoline and diesel prices creep upward, as motorists increase driving activity, Cinquegrana said. But even with the lower crude oil and distillate inventories, Cinquegrana said he doesn’t see gasoline prices going too high in 2019. Cinquegrana projects gasoline peaking at $2.80 per gallon, he said, and averaging at $2.55 for the year. A wild card could be the lower U.S. inventories for distillates, from which diesel is made. Cinquegrana said distillate stocks are below the five-year average. But the inventories also seem stable: The DOE’s Energy Information Administration reported that distillate stocks stood at 136.4 million barrels on March 9, up 3.3 million barrels from a year before. Despite prospect of the increasing oil and diesel prices, not all trucking companies engage in hedging, or buying long-term supplies low. Instead, companies such as Celadon Group Inc. look to get deals from trucking fuel stations. Celadon, based in Indianapolis, has about 3,200 trucks. Fleets are divided into groups of between 40 to 50, and assigned a fleet manager, Schmidt said. A third-party operation measures the trucks’ fuel levels at departure, according to Matthew Douglass, Celadon vice president of planning and optimization. 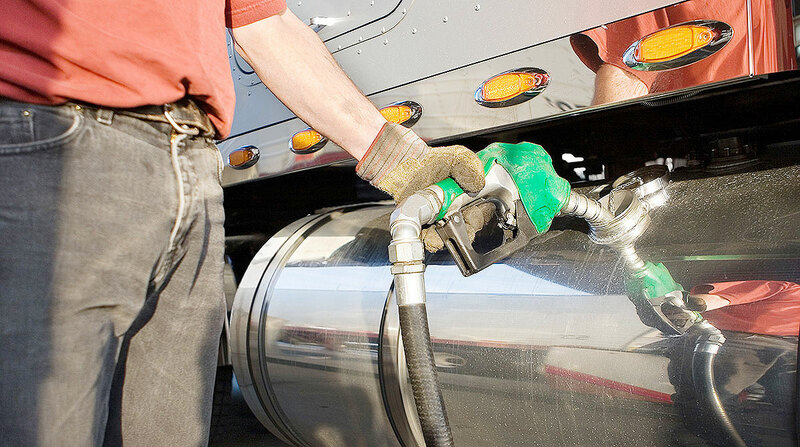 Celadon truck drivers are expected to head to certain fuel stations when they need to refuel, but they are given leeway if weather or other conditions force a refueling somewhere without a discount. The truck driver in such a situation has to notify management. Douglass said other techniques the company uses to achieve fuel efficiency are the use of sideskirts to cut down on wind resistance, and the use of auxiliary power units to heat and cool the cabs. Overall, the company strives to cut down on idling, a major cost of trucking. Celadon Group ranks No. 35 on the Transport Topics Top 100 list of largest for-hire carriers in North America.